This Cool Drive Pressure Washer Features A Cooler Pump That Reduces Heat By 25%. This commercial pressure washers is powered by commercial grade Honda GX390 Oil Alert gas engines with steel gas tank and low oil alert. Industrial black powder coated steel frame with chrome handle has a wide solid welded anti-vibration rubber foot. Cooler pump propels cool air over the pump to reduce heat. Cool air is drawn in through the outer air vents. Laser aligned patented pulley fanning system creates cool air flow and helps prevent slippage of belt drive. Steel belt guard is easy to remove with a hand screw knob. Industrial triplex pump features an oil sight glass, drain plug, adjustable unloader, external bypass system and low pressure chemical injector. Thermal overload relief valve prevents overheating. Clear bowl water filter allows easy inspection. Includes 36" insulated lance with molded grip, 5,000 PSI industrial spray gun and 50'L steel wire braided hose. Pressure washers feature quick connect nozzles in 0, 15 and 40° and soap nozzle. Large pneumatic tires roll smooth over any surface. Protoolbrands.com crawls the web to find the best prices and availability on Comet and related Pro Tool Brands products like 4000 PSI Pressure Washer 13HP, Honda GX Engine, Comet HW Pump. For this page, related items include products we find that match the following keywords: "Comet" at our vendor partner Global Industrial. 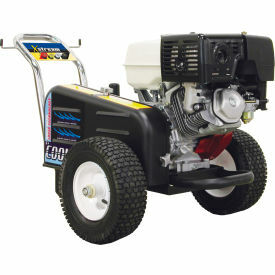 4000 PSI Pressure Washer 13HP, Honda GX Engine, Comet HW Pump is one of 78 Comet and related products listed in the Pro Tool Brands section of Tbook.com If you have any questions on this product, please give us a call at 734-971-1210 during the hours of 9am - 5pm EST for assistance. Thank you for shopping at Pro Tool Brands!